We can learn a lot about fundamental chess by comparing chess960 (FRC) to traditional "chess1". By realizing the initial setups constitute an independent variable, an enormous range of comparisons becomes possible. New ideas and new perspectives were found in abundance just waiting to be discovered. One book can only scratch the surface. Many have written about the principles of chess play for the opening, middle game, and endgame phases. Our examinations suggest some of the long accepted opening principles of chess apply only to chess1, and fail when we rearrange the pieces behind the pawns. Other more worthy opening principles apply regardless of the initial setup. The rate of middle game principle refinement would have been faster had chess960 been in vogue the past two centuries. Even the endgame is affected. This book adds the new setup phase. 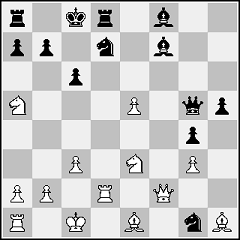 It describes a system of attribute analysis to guide the early moves in chess960. Bobby Fischer proposed chess960 to reverse growing problems in chess1 concerning repetitious openings and draws. An even greater benefit of chess960 is the wonderful variety we can now see chess1 has been hiding from us all these decades. Logical positions arising from intelligent play are not awkward, but thinking them so reveals that our experiences from chess1 are more narrow than we have realized. We have been missing out on the full richness of Caissa's fundamental chess, and that is a shame. Chess960 is just chess. Many of the world's top 25 grandmasters are accumulating victories in annual chess960 tournaments. It is time to examine chess960 in depth to discover the strategies, tactics, and variety it adds to chess in general. 9   Is the Middle Game Really the Same? Discard the 'Random' from Fischer Random Chess! Humanity should pick one of the non-traditional 959 start setups, and then stick with it for a decade. At any one time there would be two setups in broad use: the traditional setup, plus one of the better chess960 alternative setups. Book Reviews of "Play Stronger Chess by Examining Chess960"
The design of the cover is way off base. He has food for thought. The author [has] analytical powers that make what he writes worth thinking about. This [book] is better than expected. This book handles a lot of interesting topics. I must admit the analyses from Milener on Reshevsky make a lot of sense. This book is overloaded with information. Milener ... digs deeper into the play of chess 960 than any other book ever written on chess 960, and that counts also for Gligoric's book - "Shall We Play Fischerandom Chess?". This book's cover doesn't do its content justice. [On the cover], the four color pictures of rooks (all different sizes!?) from various chess sets are ugly. Milener's writing style is open and honest. You have to admire [Milener's] objectivity. He won me over with his many persuasive arguments. I have to tell you this was no easy task, as by nature I am a traditionalist. Milener provides you with a ton of useful and well thought out information that I doubt you can find anywhere else. The fact that he backs up his arguments with solid logic is sure to stimulate debate. I like this book! ... My overall review is extremely positive. On a scale of 1-10, "Play Stronger Chess by Examining Chess960" gets an enthusiastic 8.5. Before you become unhinged, I will say that I have an advance copy in front of me of a new book called "Play Stronger Chess by Examining Chess960" by Gene Milener. He's not a whackjob whether you agree with the subject matter or not. In fact, I don't agree with Gene about his attitude toward traditional chess after he "discovered" that many of the great players of today play deep lines that were played or invented by someone else and that "novelties" are way down the line. I like those NEW (when they are) discoveries. However, he has food for thought in other categories. The author is some sort of computer dude with analytical powers that make what he writes worth thinking about - that's all he asks you to do. Regular chess, as we know it, is called "Chess1". I'll have more for you later, when I get further into it. The book will retail for $16.50. If Chess4Less doesn't carry it, I will give you his website address. The design of the cover is way off base, having "nothing" to do with the subject matter except to show 4 Rooks. If there is some hidden meaning - it is way beyond me. We'll be back to tell you more and to let you know when the book is available for sale. here is an excellent write up on the Fischer Random Game. this is actually taken from a book newly published. It is great to help really appreciate this tournament. enjoy the reading. this is better than expected. A few months ago I had the opportunity to play at the schemingmind.com site some chess 960 games and to be honest it is a great pity that I did not have this interesting written book from Gene Milener! For the first time there is a real book on Fischerandom chess that explains you how to play and understand this way of play. When I played one of my first 960 games I was very surprised that my opponent suddenly castled, strange enough I had no idea that this was possible! In chess 960 it is not always necessary to castle but you must be aware that castling belongs to the possibilities of this way of play. 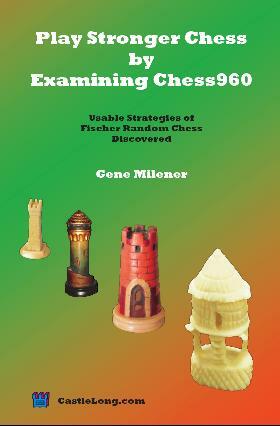 Gene Milener handles in this book different kind of strategies with openings tables and digs deeper into the play of chess 960 than any other book ever written on chess 960 and that counts also for Gligoric his book, "Shall We Play Fischerandom Chess? ", Batsford 2002. My love for chess 960 does not dig so deep as Gene Milener does in this book but handles a lot of interesting topics as Would Reshevsky have been world champion in chess 960 and I must admit the analyses from Milener on Reshevsky make a lot of sense. 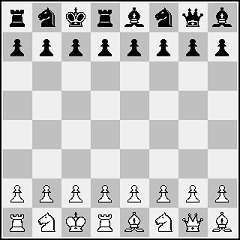 Reshevsky had a particular reputation as a player highly skilled at navigating the opening phase without benefit of deeply memorized opening lines. Botvinnink was the complete opposite, as the father of the Soviet school that elevated opening preparation to a rigorous science. Botvinnink thus had the opening phase as an advantage over Reshevsky. I suspect Reshevsky might have won this 1948 tournament and the world title if the rule had been chess 960. This book is overloaded with information and love for chess 960. 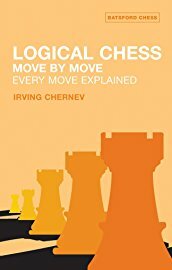 Conclusion: A must book on chess 960! In traditional chess, or what this book calls chess1, the same initial setup of White and Black pieces is used over and over for every game. In chess960 White's pieces on the first rank are randomly placed only minutes before the game starts, as determined by dice (actually, only one die is used - MJ.) On the eighth rank, each Black piece is set up on the same column as the matching White piece. Each valid setup must obey two restrictions: First, the two bishops must start on opposite colored squares. Second, the king must be between the two rooks. Once the moves begin, chess960 is just chess. Like most chess players, I really didn't know anything about chess960. However, when David, our intrepid Publisher here at Chessville, asked me to review this book, I replied, "Well, I wouldn't normally have picked it, but sure, send it over." Like most things in life that we don't understand, it is human nature to want to stay clear of it. I mean, chess is hard enough without having to look at games that looked like the pieces were knocked over and then set up on the back rank by a non-chess playing five-year-old on a sugar rush! I confess: the first time I looked at chess960 I smirked. The initial setups looked complex and even chaotic. In those setups I perceived no structure and merely randomness. The pieces were no longer arranged symmetrically on the two wings, and they were no longer arranged by how tall each stands. 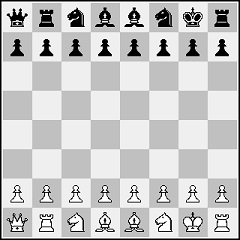 This created an illusion of chaos, aided by my then still narrow experience with initial chess setups. That perceived chaos lacked appeal the same way helpmate chess puzzles composed by problemists lack appeal to me due to their unrealistic positions. Such positions with the king in the middle surrounded by oddly placed pieces do not occur in real play. After a matter of minutes I gave up on chess960 and returned to "real" chess. Obviously, Mr. Milener no longer feels this way. What changed him? It turns out that he was looking over a game between Timman and J. Polgar from Nunn's Understanding Chess Move by Move, when he discovered that all of Polgar's beautiful moves had been played previously in several other games. For whatever reason, this slightly turned him off and got him to take a second look at chess960 where most of the landscape was as of yet still unexplored. It's sort of like going from planet Earth, where practically everything has been mapped out, to Mars, where relatively very little is known. This is where the appeal of chess960 comes in: you have to start thinking from move one! Throughout the book, Milener gives his opinion on interesting, but non-chess960 topics, such as why poker is currently popular on TV, but not chess (in a word: complexity—chess is simply too complex a game to be quickly picked up by the average TV viewer). However, Milener points out one area where chess really shines: repeated viewings. In other words, whereas watching old football or baseball games is generally not very exciting (and usually not done more than once) playing through old Morphy or Alekhine games never seems to get old, as there is always something new to learn. One thing about Milener that you have to admire is his objectivity. While he is passionate about chess960, he is willing to admit that it is not perfect. For example, Milener disagrees with Fischer's contention that chess960 will help eliminate pre-arranged draws. If a player needs a draw in the last round of a big tournament to secure victory and his opponent, for whatever reason, agrees to go along with this, Milener admits there is little anyone can do. What's more, he agrees with GM Susan Polgar who says that a draw can sometimes be a player's best strategic move and thus players cannot be expected to go against their own best interests. Milener's enthusiasm for chess960 is strong, and like the Pied Piper he won me over with his many persuasive arguments. I have to tell you this was no easy task, as by nature I am a traditionalist, and tend to come from the school of, "if it's not broke, don't fix it." In fact, previous to picking up this book, I had never even played through a single chess960 game. However, Milener makes you feel as if you're not being open minded if you don't at least give chess960 a try. Indeed, I now suspect that many critics of chess960 have never even played it! Don't fall into this trap. Milener is NOT saying chess960 is better than regular chess. He's just saying that it has a tremendous amount to offer, and I agree. In fact, I think his best argument for chess960 is to imagine that it was one of the original rule changes that had taken place in 1475, along with such new rules as castling, a pawn being able to advance two squares on its first move instead of one, en passant, etc. So now, in the year 2006, chess960 is the standard way to play chess. However now imagine that suddenly a GM comes along and says, "Hey, I want to limit the starting piece set-up to just ONE position, and no longer use the other 959 possible starting positions." Milener suspects, and I agree, that most chess players would vigorously oppose this idea, as we'd all be use to the freedom of having 960 different positions to choose from. Limiting it to just one position would seem like a huge step backwards. Of course, the reality is that having one standard set-up for the pieces is the norm, but once you think about it in this light, it does make you realize that the only reason you and I play regular chess (or chess1 as Milener calls it) is because that is how it has been traditionally played for the last 500+ years, and not because it's necessarily better. Does chess960 really eliminate the need to learn openings? I would be remiss if I did not admit to you that I am not sure if the most popular argument for chess960 is completely true. And that is that it eliminates the need to memorize openings. Indeed, Milener raises the interesting notion that perhaps Reshevsky (who was known for not studying openings), instead of Botvinnik (who WAS known for his in-depth study of openings) would have become world champion in 1948, after Alekhine had died, if chess960 had been used. While there is certainly no way to prove this, my feeling is that if chess960 ever does catch on in a big way, the top players will all begin to analyze the openings, eventually breaking them down into PKGs! (Patterns Known to be Good—a term I just invented.) Next, chess960 opening books will begin to appear, and eventually, some day far off into the future, I can just imagine some chess player lamenting, "Ugh, chess960 is no fun… all the openings have been analyzed to death!" Obviously this is a long way off, but I do believe that it is an eventual logical outcome, given that certain patterns of development are better than others. Indeed, I would be surprised if top chess960 players haven't already begun to categorize which opening set-ups work best against certain defenses. [Editor's Note: Indeed the research into the opening has already begun - see (https://www.chess.com/clubs/forum/view/on-the-opening-in-chess960-frc), On the Opening in Fischer Random Chess by Robert Tuohey. Anyway, I just throw this out here as food for thought. Although my overall review is extremely positive, there are a few areas of the book that I felt could have been improved. 1) The first has to do with the cover. While most chess reviewers focus on a book's content and rarely discuss its cover, those of you who have read my reviews know that I almost always comment on a book's cover. This is because the reality is people DO judge a book by its cover! A good looking cover draws you in and makes you want to pull the book down from the shelf. Unfortunately, this book's cover doesn't do its content justice. First of all, the cover type is too small, with the subtitle being painfully small. Secondly, the four color pictures of rooks (all different sizes!?) from various chess sets are ugly (also, what do four rooks have to do with chess960? I think a photo of two super GMs playing chess960, such as Ponomariov and Svidler - both of whom play it - would make a far better, not to mention more persuasive, cover shot.) Clearly this book was self-published, and while there is nothing wrong with this, if you are not an expert on cover graphics and layout, you would be wise to hire someone who is. This also applies to the books interior, which is somewhat dry and technical looking due to the numerous charts. Some photographs of people playing chess960 (both GMs as well as class players), as well as some drawings (chess cartoons to help illustrate key points?) or other art work would have made for a more visually pleasing book. Also, a chapter containing interviews from some of the world's top GM's on there thoughts on chess960 would have been interesting. 2) Another flaw I noticed was that the book was printed too high on the paper (at least my copy is), meaning that there is 3/4 of an inch of blank space at the bottom of each page and only 1/8 of an inch of blank space at the top. While these flaws (poor cover and printed too high) do not hurt the book's content, they do somewhat detract from the books overall appeal (how much depends on how important a book's aesthetics are to you), and should be corrected in any future reprints. 3) The author uses the letters WCC throughout the book to indicate World Chess Champion, however I would have preferred he drop one of the C's, and simply use WC (meaning World Champion), as the word "Chess" is not needed. I say this because most chess players are use to WCC meaning World Correspondence Champion. 4) This is not so much of a quibble as an observation: Milener uses the strange word "plair" to indicate when a move for both Black and White (a pair of moves) has been made. The word comes from combining the word "ply" (meaning a single move for either side) with the word "pair" (meaning a move by both sides has been made). Milener justifies the use of this word as being less cumbersome than saying, "pair of moves" or "set of moves." While I can't think of anything better, I will say that when Milener writes, "So Kasparov successfully predicted the first 21 plairs…" it does sound strange! I like this book! Mr. Milener's writing style is open and honest, and his enthusiasm for chess960 is infectious. As I mentioned, I would not have thought to pick up this book, but am glad I was asked to review it as I found the subject matter quite fascinating. Indeed, a treasure chest of new and interesting adventures awaits those that are willing to explore the world of chess960. Will it ever replace standard chess? No, but can it help improve your overall chess skill and is it a lot of fun? Yes. Just as playing "bug house" helps you develop an eye for unusual mating patterns, chess960 can help you understand the full power of each chess piece and their often surprising capabilities. Lastly, if you are one of the minority that already play chess960, this is a must purchase as Mr. Milener provides you with a ton of useful and well thought out information that I doubt you can find anywhere else. The fact that he backs up his arguments with solid logic is sure to stimulate debate amongst chess960 enthusiasts (this is a good thing!). On a scale of 1-10, Play Stronger Chess by Examining Chess960 gets an enthusiastic 8.5.